Fisher v. Texas: Another civil rights movement on the way? Students of color are again under attack in the Fisher v. Texas case currently being decided in the US Supreme Court. For past attacks see Bakke, Hopwood, Grutter and Gratz. Considering that Grutter upheld race as one of many factors under a decade ago, conservatives on the court appear to be determined to strike down race/ethnicity as one of many factors in admissions. It doesn’t seem to matter to Fisher (or Scalia or Thomas etc.) that students of color with better scores than Fisher were rejected and White students with lesser scores were admitted. We addressed the historical enrollment of African Americans and Latinos at UT-Austin in recent papers. We believe the historical data contained within these papers is a unique analysis of historical enrollment of students of color at UT-Austin. Our findings: Over the past 75 years the under-representation gap has decreased for African Americans at UT-Austin. 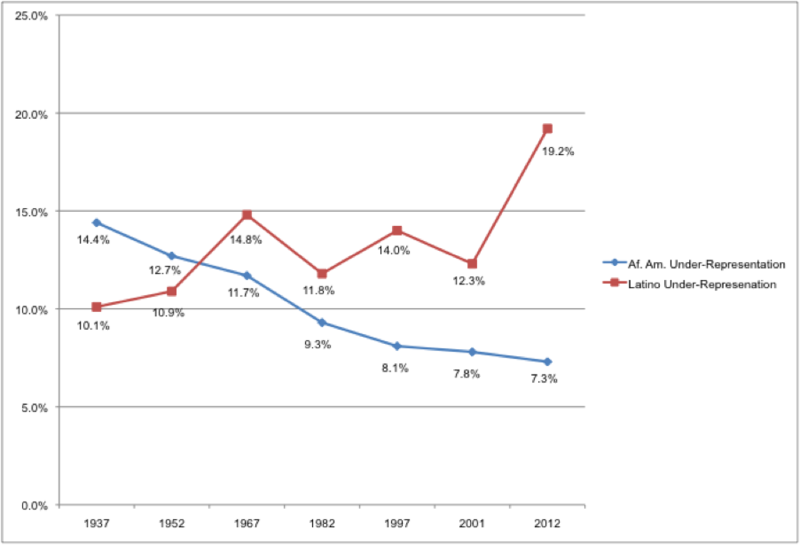 For Latinos, the gap decreased until the 1982 data point, then the under-representation expanded to almost 10% by 2012. Notably, both groups are still heavily under-represented relative to their total proportions in the state. The under-representation graph is actually a conservative estimate because the school-aged population is currently 50% Latino in Texas. For example, if you were to use this number as the baseline, the under-representation of Latinos at UT-Austin would balloon from ~19% to ~32%. If Affirmative Action is abolished in Texas and elsewhere, I suspect these gaps will expand in Texas and considerably more so in less diverse states. Is creating greater inequality in higher education access the way through to a more equitable society? The line of reasoning that by ignoring race we create equality is clearly convenient for some, and inconvenient for others. The thinly veiled arguments of abolishing “racial preference” when racial inequality still exist throughout society will only result in the re-segregation of higher education rather than a new “post-racial” society. As students of color are increasingly pushed to the margin and denied access to higher education, I wouldn’t be surprised if a second civil rights and protest era arises. If a consistent Latino vote finally emerges, there will be severe political consequences in Texas and elsewhere. Would be interested to see how the “under-representation” numbers change when adjusted by SAT scores, i.e. are latino students being kept out of college despite scoring higher? or are they being admitted at a disproportionately higher rate. Choquette Hamiltons recent dissertation examined this. When all things are equal, Whites more likely to be admitted to UT. In order to more fully appreciate this comparative graph, where is the data for non AA and non Hispanic census/enrolees. I’m not sure you are proving under-representation without a full complement of comparative data. We were interested in the under-representation of Latina/os and African American relative to their census populations. I would recommend you read the two articles to understand how we conducted these calculations. We did not conduct counts of Asian Americans, Native Americans or Whites in the historical analyses. We did do combined analyses of Latina/os and African Americans together relative to their census numbers in the papers. You could subtract from 100 and make the same calculations for the other three groups combined.